A carpentry shop worker started the day by purchasing a $10 Black Ice Millions ticket. 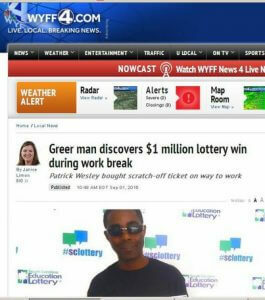 By lunch break he was a million dollars richer. He promptly left work to claim his prize right away. Patrick Wesley attributes his win to pure luck – he beat odds of 1 in 1.6 million to win the prize. He says that the windfall will allow him to buy a house. The Scotchman 3859 in Greer earned a bonus of $10,000 for selling the winning ticket.